There is a dearth of obesity study among sub-Saharan African immigrants in Seoul, Korea. We investigated the prevalence and perception of obesity among this population. 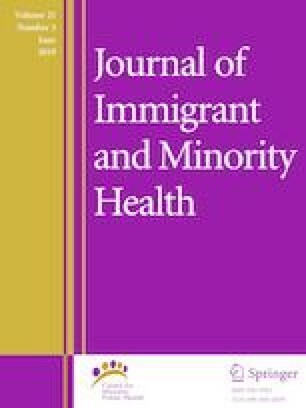 A cross-sectional study involving 211 immigrants aged 20 years and above from sub-Saharan Africa was carried out, using a structured questionnaire. Obesity (BMI ≥ 30.0 kg/m²) was calculated as the primary outcome variable. The overall prevalence of obesity was 27.0% (men 22.6% and women 36.8%). In a logistic regression analysis adjusting for age, obesity was significantly associated with increased duration of residence. Participants were 4.03 (95% CI 1.63–9.94) more likely to disagree than agree that obesity is a sign of wealth and that it gives respect. There is an urgent need to assess the possible factors predisposing sub-Saharan Africans to obesity and interventions should be designed targeting their lifestyle modification for healthy weight. We thank the Nigerian embassy in Seoul for endorsing the study and participating, the church leaders and the study participants for making this study possible. We are also grateful to Alaeze Ogbonna and Lydia Asante for helping in recruitment and taking measurements of the participants. All authors contributed to the study. Writing of manuscript: Ijeoma Alaeze. Review of discussion, development of questionnaire: Sungsoo Chun. Statistical analysis and research design: Mieun Yun. Development of the basic concept and theory, methodology, guide in the writing process and editing: Maxine Newell. The research was approved by the Sahmyook University Institutional Review Board and provided in accordance with the declaration of Helsinki. Korean Statistical Information Service. http://kosis.kr/statisticsList/statisticsList_01List.jsp?vwcd=MT_ZTITLE&parentId=A#SubCont. World Health Organization. Definition of key terms. 2013 http://www.who.int/hiv/pub/guidelines/arv2013/intro/keyterms/en/.